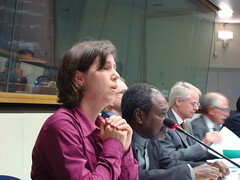 Brussels, 16 October 2008: In the 7th Brussels Development Briefing on rising food prices, Stineke Oenema representing the CONCORD European Food Security Working Group called for sufficient policy space of developing countries to make independent decisions on protecting their markets. Can a new green revolution be a solution? In her opinion, we have to learn from past lessons: Research needs to be based on local needs, and not only on export products. Trade policies? : Examples from Cameroon and Bolivia show that developing countries need some protection to strengthen their own production sectors. Countries need sufficient policy space to decide independently on their own food security strategies, independent from international advice. “Sufficient border protection is needed”, she said. Besides these challenges, she also identified opportunities in the current food crisis. It brings people together and unifies forces to tackle the crisis. The current crisis opens a window of opprtunity to design a new food system, taking into account trade, nutrition and agriculture. The right to food states that “every man, woman, child has the right to adequate food”.